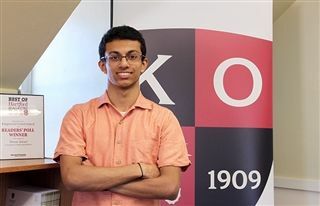 Well, for one KO student Rohan Naik ’20 that rings very true. From February 7 to 10, Naik will be performing in the Stern Auditorium at Carnegie Hall, one of the world’s most acclaimed venues for classical music in the High School Honors Performance. The conductor of the Kingswood Oxford orchestra Richard Chiarappa nominated Naik to audition for the coveted series. Last June, Naik played the violin in an online audition of a Vivaldi concerto, submitted the file and crossed his fingers. At the end of October, Naik heard the good news. “I love this opportunity to play at this prestigious venue. I never thought that I’d be able to do it. As I auditioned I thought, ‘Well, let’s see how this goes’. When I found out, I was speechless,” Naik said. When Naik was five, his parents took him to an instrument shop in India. At the time Naik was interested in drums and percussion, but when he picked up the violin and started playing he thought it had a beautiful sound. “It just rang with me,” he said of the instrument. Since then, Naik has taken lessons, performed with his local church, the West Hartford Symphony Orchestra (WHSO) and the Hartt School orchestra. Chiarappa, who also conducts the WHSO said, “I'm very happy that Rohan followed through on applying for this terrific opportunity. He will get to meet fellow talented and serious-minded orchestra students of his own age and then rehearse under the baton of a professional conductor to perform wonderful music in the famous Carnegie Hall in New York City. What an experience this will be!" Naik will head to Manhattan on February 7 and will spend several days practicing with the full orchestra before the final performance on the evening of February 10. “I love playing the violin. It’s very relaxing and takes the stress out of my school workload,” he said.